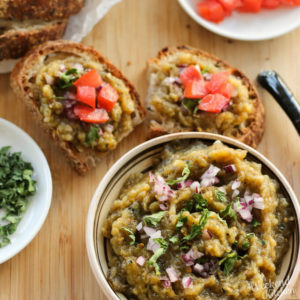 This smoky roasted eggplant dip is great to spread on toast or use with pita, chips and/ or assorted crispy vegetables. Lightly seasoned with salt and pepper and with tiny bits of onions and tomato, it lets the taste of smoky eggplant shine through. 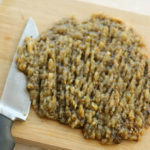 The recipe for the traditional Romanian eggplant dip (or salad) is simple with just 5 key ingredients — eggplant, garlic, salt, pepper, and oil. You can add some finely chopped onions (like I have done) and also some parsley and tomato for variations. In the original recipe, the garlic is added raw but I prefer roasting the garlic along with the eggplant. Roasted garlic lends a mild sweet flavor to the dip and also removes the sharpness and pungency of raw garlic. Romanians actually call this deliciously smoky eggplant dip, a salad — Salata de Vinete (eggplant salad). During our first month of coming to Bucharest, friends of ours took us out for a traditional Romanian dinner. When I saw roasted eggplant salad on the menu, I was pretty intrigued as to what will an eggplant salad look like. I was expecting something like grilled eggplant slices with salad vegetables but when it came, it was actually an eggplant dip. I fell in love with it in the first bite. in Israel, I once had an eggplant dip with pecans and blue cheese. But it all starts with one key ingredient — a perfectly roasted eggplant. How to roast an Eggplant on open flame? Roasting an eggplant on your cooktop burner flame can be very messy but it is well worth it. It lends a beautiful smoky aroma to the eggplant which you cannot get when you roast it in the oven so if you have a flame burner, I would highly recommend you to roast your eggplant on it. To reduce the mess a little, line your cooktop with an aluminum foil so that all the juices that flow out can easily be collected and cleaned out later. Prepare the eggplant by making four slits (just slightly more than skin deep) lengthways on four sides. It helps in opening the eggplant after roasting and remove the skin. I also place small garlic pieces inside the flesh of the eggplant on each of these cuts. The garlic also gets roasted with the eggplant. Place the eggplant on a rack above the flame and roast. Keep turning the eggplant occasionally so that the skin is blackened and burnt from all sides and the flesh inside feels soft when pierced with a fork. Takes about 10-15 minutes depending on the size of the eggplant. Remove from flame, put it into a bowl and cover with a plate for 5 minutes to cool. Once cooled, peel off the skin or scoop out the flesh with a spoon. Place it on a cutting board and finely chop it to get a coarse paste. Some people to save time, suggest just blending it in a processor but I feel that just turns the roasted eggplant into a homogenous paste and I prefer the spread with some bits. You can choose to do either depending on the texture you prefer — coarse or smooth. I love exploring new cuisines and living in a new country provides so many opportunities to do that! 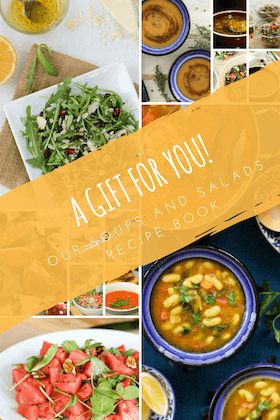 You might want to read about more traditional Romanian vegetarian dishes like the White Bean Soup or the Purple Spinach Soup. I will continue to explore more of this wonderful culture we are currently part of! If you like this recipe, please take a moment to rate it and/or leave your comments at the end of the blog. It will really encourage me to keep exploring, learning and improving. 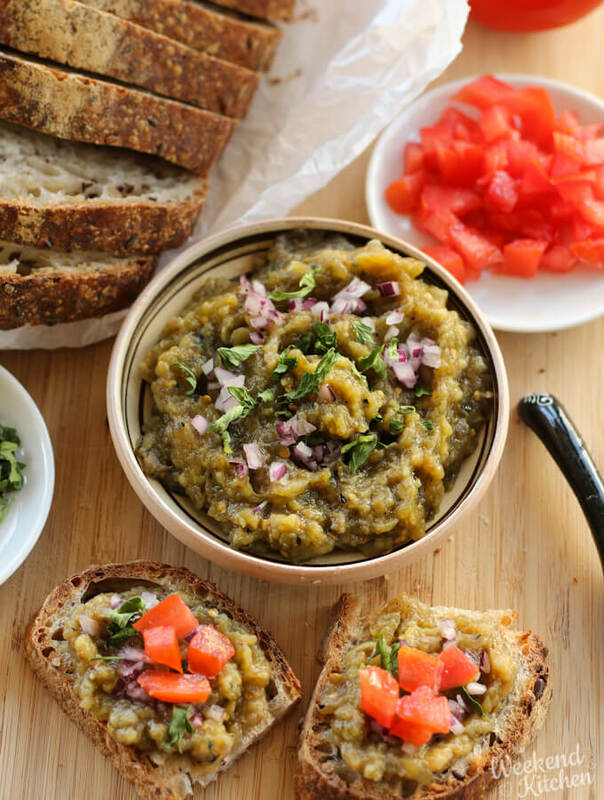 This smoky roasted eggplant dip is great to spread on toast or use with pita, chips and/or assorted crispy vegetables. Start with a perfectly roasted eggplant, season with a little salt, pepper, olive oil and add in some onions and garlic. Simple, delicious, and very handy. Cut slits in the eggplant and push in a few garlic slices through the slits. Remove the skin and scoop out the flesh. 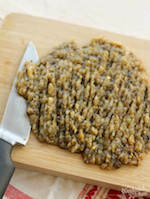 Place the eggplant flesh on a cutting board and finely chop to get a coarse paste. Place in a mixing bowl and add the rest of the ingredients. Mix well, cover and chill in the refrigerator for at least an hour before serving. Serve cold with bread, chips, or vegetable sticks. As a spread on bread, I like to add some parsley and a few tomato pieces on top of the eggplant spread. If you don't have a flame burner, you can roast the eggplant in the oven. 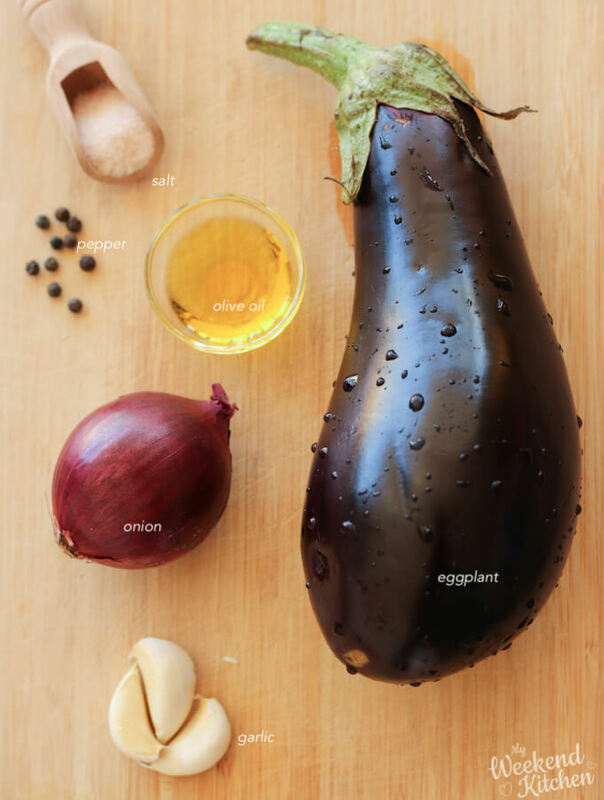 Prepare the eggplant the same way as for roasting on the flame, cover in foil and roast in a 180ºC preheated oven for 40 minutes, till the flesh feels soft when poked with a fork. The dip (without the raw onions) will stay good in an airtight container in the refrigerator for 3-4 days. Add in the raw onions at the time of serving. Hi. Just came home with a big box of eggplant I bought for $4! Do you know if this can frozen? Yes, you can freeze it. You can also freeze just roasted eggplant and then thaw them whenever you want to make this eggplant spread or any other roasted eggplant recipe! That looks lush. I’ve been meaning to try cooking aubergine this way over a gas flame, but haven’t tried it yet. Must give it a go. Sharing this. YUM! Open flame adds a whole different dimension to roasted eggplant. Highly recommend it! I bet this tastes amazing! I used to buy something very similar in my local supermarket but they stopped doing it so I really should try your recipe! You win the bet! 🙂 This tastes absolutely amazing. I love these little vegetarian gems from Romanian cuisine. I want try the zakusca next which is roasted eggplant along with more veggies. You should definitely try it out… The recipe is easy and you are sure of that when made at home, it will be without any odd ingredients. What a tasty dip – I’m definitely going to be trying this on toast for sure! Eggplant is something I really don’t use as often as I should. I hope you really try this out. In India, we call eggplant the “king of all vegetables” and I think it is so apt. I love using them in all different kind of recipes from spreads, to starters, to mains! I’ve never roasted an eggplant over an open flame but I’m sure the smokiness of the fire does compliment the vegetable very nicely. Thanks for this delicious recipe and the tip.